The cardigan is the go to fashion staple for woman of all ages, the one dependable item of clothing which can be worn with anything. 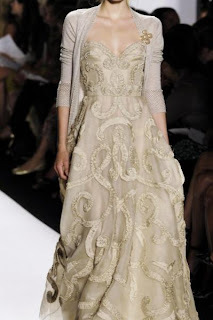 It can be simply thrown on whilst running errands or worn over a beautiful gown as seen at Oscar de la Renta. So why not glam up your cardigan? If you don't have a ball gown to hand all you need is a sparkly brooch to transform an ordinary cardigan into a chic wrap sweater. This is so easy and looks great, just take one side of your cardigan and pull it to the other side securing it with a brooch. Here's one of my favourite affordable brooches, but I think some of the best unique gems can be found hidden away in little antique shops in the likes of Portobello Road, so get searching!